As it gets closer to the February 25, 2019 polls, tensions between political parties, their supporters, families, and the media—as much political rhetoric and propaganda is being circulated—is causing friction in the community. Many have blamed Hon Myron V. Walwyn (AL), the Chairman of the National Democratic Party (NDP 1) for running one of the most divisive campaigns in the history of the Virgin Islands (VI), putting local residents against those from the Caribbean islands. This type of politics has been condemned by Bishop John I. Cline and the BVI Christian Council. Many have also raised concerns, on if the elections will be free and fair or whether there is an attempt already by some elements—including the Election Office—to steal the elections. However, they have yet to bring forward compelling evidence, only saying the voters' 'list is padded', in districts five and eight. The Royal Virgin Islands Police Force (RVIPF) are, therefore, going through special training in an effort to be prepared. 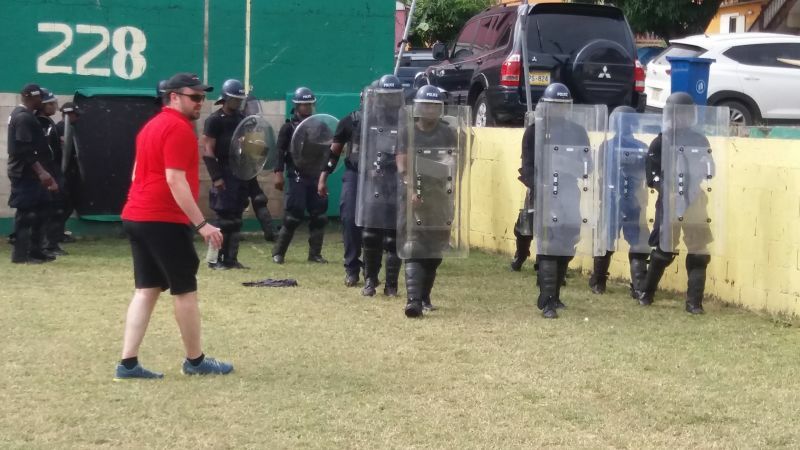 Not only is the UK paying the bills for the training, but they are also benefiting as it is a UK-based company, Red Snapper Learning, who was contracted to deliver the three-week training for Police officers. 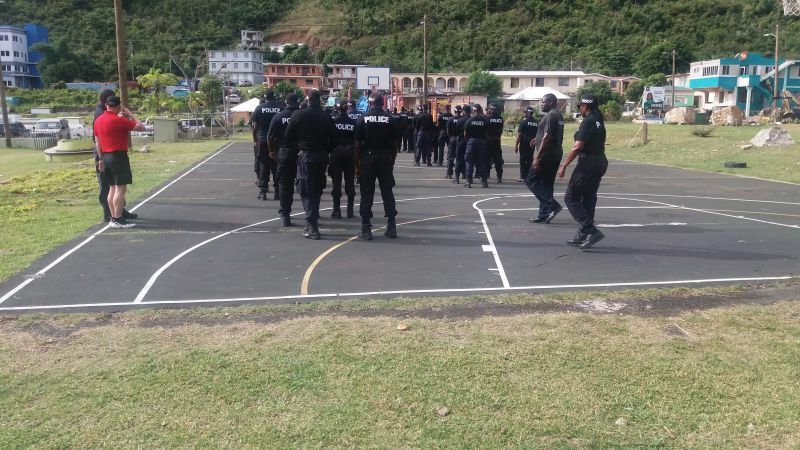 According to police officials, a similar training for 20 officers will take place at Her Majesty’s Prison, in maintaining safety at that institution. Wtf, please tell me that is a joke, who's idea was thst, lol! @the rock. The idea is that of the Commissioner of Police and it is not a joke. It is imperative that the police prepare for any eventuality. Take nothing for granted. This is something that happen in every Caribbean country during election time. Get with reality. Not here inn the bvi, tell me when you ever heard we behave like that! BVI y'all sleep walk right into this one and the sad part is you are still asleep. Give us a better head line than that. 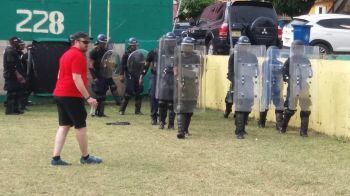 "Nonsense"
The late calypsonian Kenneth Hodge "Kenny" once sung about "he not seeing terrorist in the country yet the police training daily. This look to me like an idea of comedy"
Whiskey Tango Foxtrot! In 1901, the VI Legislative Council was put on pause and as a result of the 1949 March, the Legisaltive Council was re-established in 1950. Along with 1950 LegCo reinstatement, the electorate was given the opportunity to direct vote for some members of the LegCo. Further, Ministerial government was ushered in 1967. The BVI has had tens of elections since 1967. And to my knowledge, no violence occured as a result of the election results. Moreover, again to my knowledge, there has always been a peaceful transfer of power from one government to another after an election. Admittedly, perhaps, things have changed and the RVIPF may have intelligence that it cannot share with the public that violence may occur as a result of the election. If true, this makes the BVI behave like a Banana Republic; it does not bode well for procuring external investment, foreign direct investment.......etc which is the lifeblood of economic activity in the BVI. Moreover, true the RVIPF must train effectively for any and all eventualities. 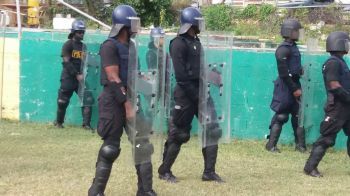 However, the training could have been conducted in a seamless manner as a routine training exercise. Like other police forces, the RVIPF has to train consistently to stay skilled/current, hone its skills, keep up to date on new emerging tactics, use of new weapons, simulate potential occurrences .....etc. Loose lips sinks ships. Police like other security forces and the armed forces, ie, Navy, Marine, Army, Coast Guard and Air Force must exercise fire discipline. Further, this is a critical election and the campaign may be heated and white hot. The combatants are campaigning hard, using past performance, policies, programmes, strong above the belt rhetoric, promises .... etc as their weapons. On the evening of 25 February or early morning 26 February, the territory will know the results of the elections. Some combatants will be disappointed in the results but there will not be any violence. The BVI is a civilized society; its people are peaceful and law abiding. In the BVI, the rule of law is a core principle and is celebrated. Fellow Virgin Islanders, exercise hour constitutional right by racing to the polls on 25 February and vote for BVI interest. Fada, I dey cry fo meh people! The Road Dog is exiting the road way and entering the piping hot election discussion. The following is a line from E. Leonard post: “However, the training could have been conducted in a seamless manner as a routine training exercise.” Agree. The RVIPF must be prepared. But there should have not been any mention of the training and election. The training should have occured as far as the public is concerned as just routine train8ng. The timing of the training is another issue. Timing is everything. Why is the training occuring just days before the election? The timing leads to unnecessary speculation. Was the timing a message to any perpetrator(s) of violence that the RVIPF is ready? Nevertheless, the outside world is watching, monitoring, forming opinions......etc so we must cognizant of the messages that we promulgate. Anyway, I’m getting back on the roadway and looking for a fire hydrant to do dis ting.